Aromatherapy has been proven to work wonders in relieving stress, inducing sleep and in general relaxing the body. This is not a modern day scientific discovery, but an age old tried and tested technique. The modern day aromatherapy techniques required a diffuser or humidifier that uses a blend of essential oils and sometimes water. The diffuser uses various techniques like heating or ultra violet vibrations to diffuse the oils into the air and create the ambiance. The most important aspect of any aromatherapy is the blends of essential oils. These oils typically are obtained in small containers are quite expensive. However, given their benefits, the high costs are value for money. But, you don’t have to rely just on ready-made oils for your next aromatherapy session. If you grow typical aroma therapy plants in your household garden, you can extract oil by your self. Common sources of essential oil are flowers, some medicinal herbs, etc. You can plant these in your backyard and use them for your essential oils. 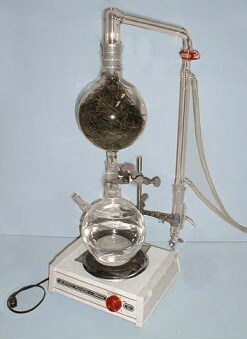 To extract the oil from these plants you need a unit called the Essential oil distiller. It works on the same principle as the simple water distiller, but it has a separate compartment for storing the plants and that allows the oils to be extracted. Depending on the design of the distiller, you would have different things to take care of. Some distillers rely on heating water to high temperatures and then condensing the steam to collect the oil blend extract. Others would have different variations of this basic process. The most basic aspect that you must take care of is that you must always stick to dry plant parts rather than the fresh ones. There are a couple of reasons, using fresh parts means that the source already has some water and adding stream to that will dilute the oils further – you need as concentrate extract as possible. Secondly, dried leaves and flowers occupy less space, so you can add more of these to the distiller, giving you more concentrated extracts. Here is an example of what an essential oil distillers looks like and some information about the product itself. This is a vertical steam distiller made from Pyrex glass. It is highly effective to extract high quality oils, at the same time, it is very simple to operate; so a non-technical person can extract oils at home. This unit is designed to ensure that the oil extracts never come in contact with any other material, but pure industrial grade glass, giving you the highest quality product. The unit uses an open to atmosphere concept which means that the hot steam will never stay in the unit building up pressure, which can be risky. The unit consists of distinct sections for the biomass and the boiling water stacked on top of each other. The separation ensures that over heating water will not affect the biomass and the vertical stack ensures that water does not stay in stuck in the biomass container. The unit is designed in such a manner that you can collect up to 20ml of different oils. They use water to separate the two kinds of oils. Besides, this model there are other larger and smaller distiller variations that can be used for your essential oil distillation. You can look for them online, compare their features, costs and choose the one that suits you the best.